These fish cakes, with their lovely crisp coating and soft texture inside, are the ultimate comfort food. Cod goes well with lemon and garlic, so try serving the fish cakes with homemade tartare sauce or Waitrose Garlic Mayonnaise. Poach the cod in enough simmering water to just cover it for 3-4 minutes, until the fish starts to flake and the skin pulls away easily. Drain, discard the skin and pat the fish dry on kitchen paper. Leave to cool. Boil the potatoes for 10-12 minutes, or until just tender. Drain well and mash until smooth. Beat in the butter, nutmeg, parsley and lemon zest, flake the cod into pieces and stir in, season to taste, then set aside to cool for 10-15 minutes. Divide the mixture into 8 and shape into ovals about 2.5cm thick. Cover and chill for 30 minutes or until required. Season the flour with cayenne and a pinch of salt. Dip the fish cakes in the flour until lightly but evenly coated. In a frying pan, heat 3 tablespoons of the olive oil. Fry the fish cakes (in batches if necessary) for 3-4 minutes each side or until crisp and golden. Drain on kitchen paper. Arrange on a plate with the lemon wedges, rocket and flat-leaf parsley. Chilling the cod cakes in the fridge before frying them helps to prevent them from breaking up. 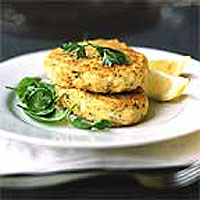 The fish cakes can be prepared to the end of step 3, then chilled for 24 hours or frozen for a month. If freezing, defrost thoroughly before continuing from step 4. You can use other types of fish for this recipe. Smoked haddock and salmon are particularly good alternatives.